Scandi-crime addicts, proceed with caution. 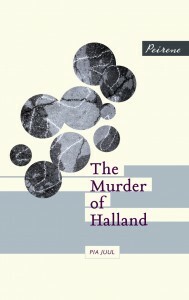 The Murder of Halland is not a novel in the tradition of Nesbo, Indridason or Mankell. Yes, it’s a murder story, but the laconic declaration of the title should act as a hint. Danish poet/novelist/translator Juul’s tale is less a whodunit, more a snapshot of grief, of irrational behaviour after loss, of complex and indirect relationships. Sometimes comic, sometimes lyrical, especially when the gaze of its narrator, Halland’s partner Bess, a writer of short stories, is distracted by the ever-changing visual beauties of her local fjord, it sets itself at some distance from the popular mystery category. Some conventions of detective fiction are nevertheless observed in the book: secret rooms, secret relationships. But their functions and revelations are treated differently, both by Bess and the author. Bess has no interest in the contents of Halland’s laptop, found behind a locked door in the room he had been secretly renting and to which his mail was being diverted, unbeknownst to her. And Juul never gets round to spelling out directly what all that furtiveness was about. The fact that it was taking place, and that Bess lacks curiosity, are the thing. Bess, in fact, observes few of the niceties of her bereaved role in the story or in the norms of crime fiction. She is not interested in the police investigation into the identity of Halland’s murderer. She behaves impulsively and badly, kissing her neighbour, attending a reading at a library and then running away before the show, with the performance fee in her pocket. Hypnotic, unsettling, at times surreal, Juul’s short novel concludes by throwing the reader the occasional bone of explanation while other questions are left open-ended. Her portrait of a woman on the edge of a nervous breakdown is its strength, as is its exposure of the private mysteries of a ‘normal’ relationship, of an everyday life. Bess’s role, revelations and behaviour are the subject here, Halland’s murder merely the trigger to their manifestation, in a witty, modern little tale that resembles a murder story only in a deconstructed sense. A multi-part, peak-time television adaptation seems unlikely.